I wish I had been more awake last night when I frogged the Turkish Bed Socks that I knitted this weekend. But it was late and I wasn’t thinking well. Needless to say, I gave it a shot with my wonderful Lorna’s Laces sock yarn and smaller needles (because that’s what the yarn needed). The striping came out really well and I liked the way the socks were looking but they were too small this time. 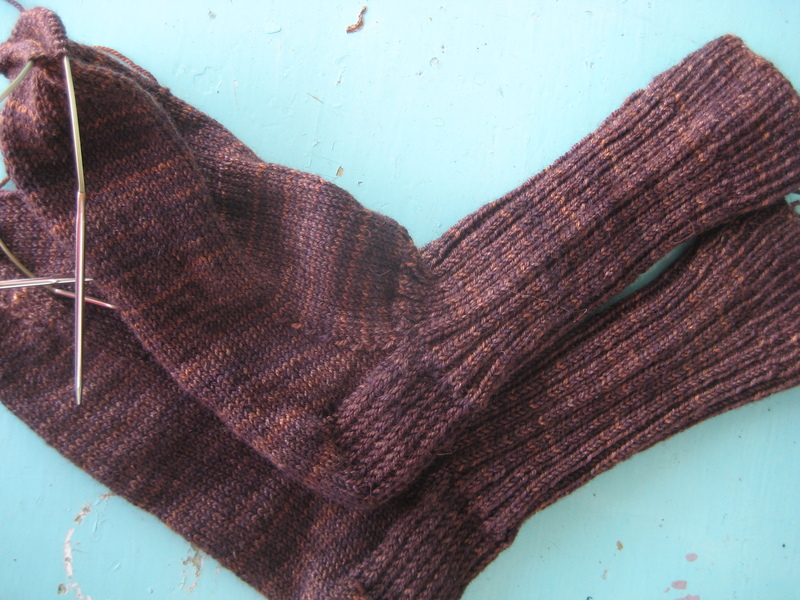 Turkish Bed Socks in Koigu KPPPM – the first pair … too big! The last pair (the first pair) I made were too large … which is why I decided to try smaller needles and thought the lighter-weight yarn would be OK. My first pair are wearable but the heel wrapped part is too low on my heel and they slip off. So I wanted to knit a second pair only smaller – But it was too much smaller. The heel wrap was too short (didn’t come up high enough on my heel) and the whole thing was just too tight. And, even though I added a bunch of rows to the length of the foot, they were still too small. OK. Let’s move on. So, now I’m going shopping in my stashed yarn and I will find a more appropriate skein of yarn and then I will knit it again. When I get a pair of socks that I am happy with, I will happily adjust that pattern to work with lighter-weight yarn! So many patterns and so little time! Today I visited my LYS here and bought a new knitting needle – a 40″ US 13 Addi that I will be using to make my life much (MUCH!) easier. I finished the bottom of my Noni Medallion tote bag and had started picking up the stitches around the bottom for the main part of the bag. The two needles that I had on hand were not working for me – yarn was getting twisted and it was a mess. My new needle makes life oh so very much easier! The two colored knitting colorwork is getting better and better with every row. 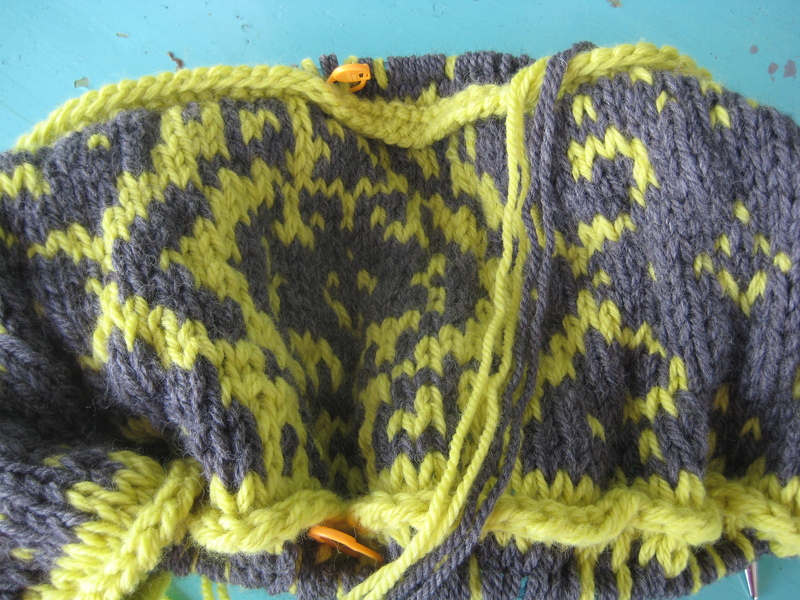 Knitting in the round on the right side is so totally more easy than purling on the wrong side! Anyway, I got the new needle today because otherwise, I am going to have to knit with two needles and that’s a challenge for me – particularly since this is my first colorwork. Did I mention how much I like my colors? I am looking forward to seeing the bag once the colors and pattern really start to show! When I was at the Yardgoods Center today, my darling Betty, who also happens to head up my Wednesday night knitting group, sold me a new sock yarn which I will wind and cast on this week! I’ll be happy to knit with and make another pair of socks – and she’s going to teach me how to do two socks at once. The yarn is a German brand … it’s hand-dyed and wound with two strands together so that when you make two socks at once they come out exactly the same. 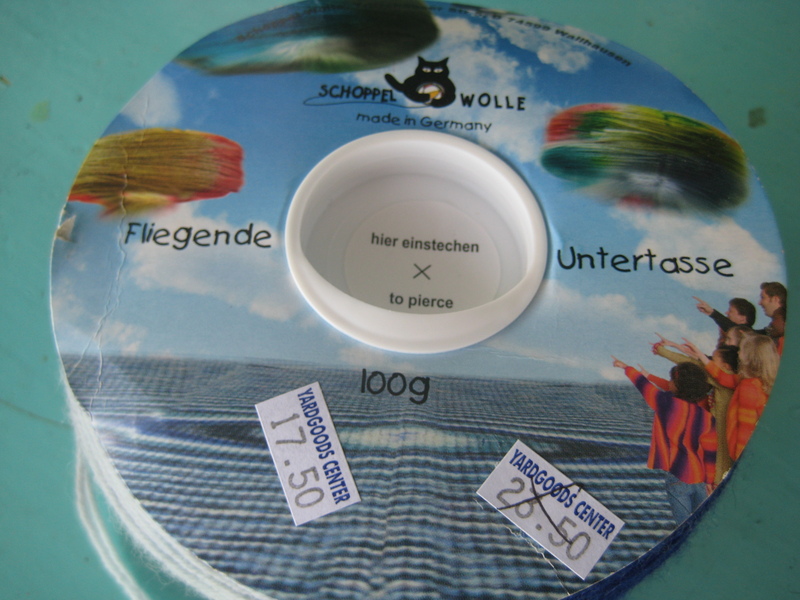 Fliegende Untertasse means flying saucer, she tells me … and that’s what the package looks like. Very different and we’ll see how it looks when I get knitting! I started to look for a yarn with which to make some fingerless gloves for a darling girl who I haven’t knitted anything for yet. Her birthday’s coming up and she loves gray. Pattern will be with me on Wednesday (I love the Yardgoods Center! They have knitting classes several days and nights a week, it’s not overly expensive and you get a 10% discount on all purchases.) I’ll find yarn on my knitting night because I know I don’t have the right color in my stash that I brought up with me. 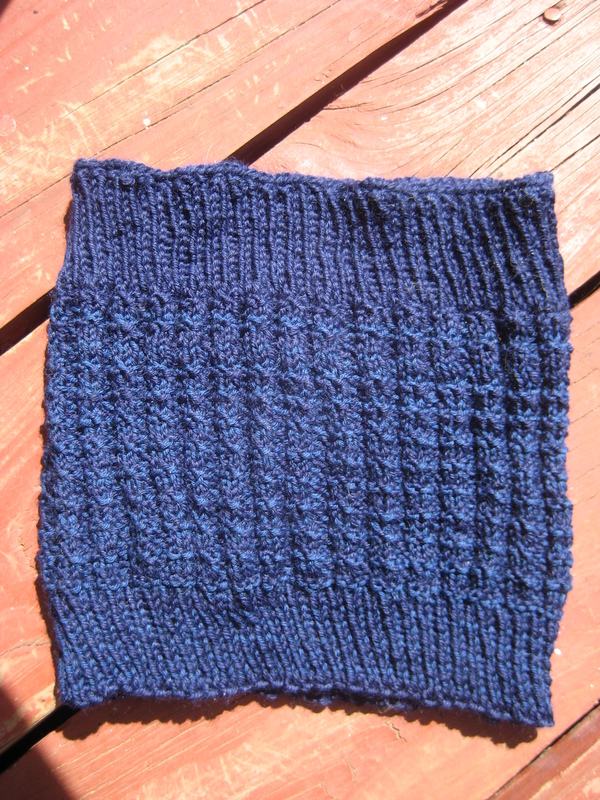 OH, I forgot to mention that I finished a new cowl. This one will go up for sale in my Etsy shop pretty soon. It’s made from two different navy blue wool blends so it feels really soft and it will be washable (in the machine, on cold and gentle cycle, always lay flat to dry) and wear like iron. I love the way it turned out and it reminds me of the color of our lake when it’s a beautiful blue day with a little breeze. Bella mittens, colorwork fingerless mitts (fiddlehead pattern from Ravelry is really cool. The “yarn lady” at my LYS had a pair made in two shades of grey, black, cream and lined with grey – yes, in my head there is another pattern to try.) Oh, yeah, and there are the sweaters that I want to design for my dog line. Oh my goodness, there is a lot of yarn out there and I really want to try it all! So, with that, I’m out of here – going to bed so I can knit again in the morning!